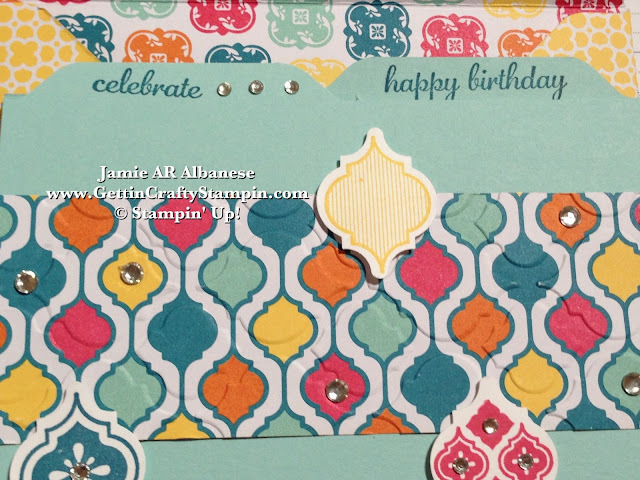 Getting Crafty with Jamie: File it under... Celebrate! I've taken this year and started to get ORGANIZED!! It's so exciting to actually find my files where I want them - when I need them (for home and business)!! Then again... my husband and kids received the memo but ignore it - lol. So as I attempt to get the whole family organized (sigh, lol) I couldn't resist creating this fun card that celebrates... organization, cuteness and someone's special day! What do you think?? Leave me a comment and let me know. Share, Pin, Email, Facebook, Google+ and Tweet it, let's include others in the fun!! With the Quatrefancy Specialty Designer Series Paper is Bold, Bright and Fun... perfect to honor a celebration of a birthday!! 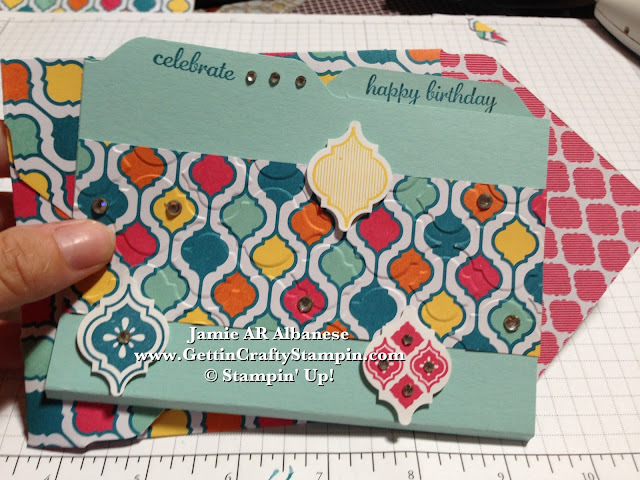 Here the paper coordinates with the Mosaic Madness Bundle (#132733 Stamp set and coordinating punch for a 15% discount!!). 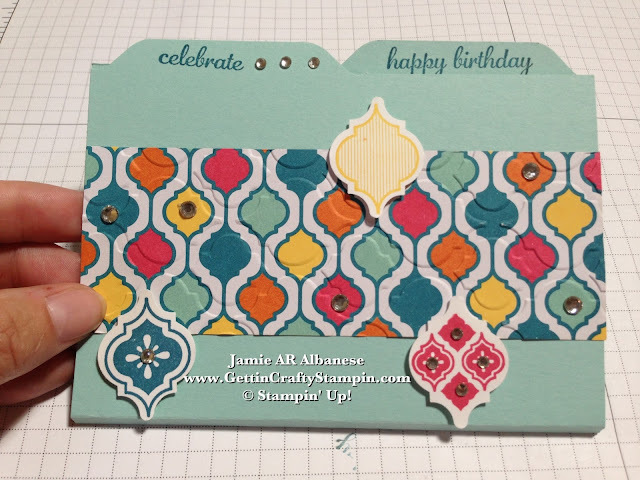 Embossing the Quatrefancy paper with the Big Shot Die-Cutting Machine (#113439) and the coordinating Modern Mosaic embossing folder (#129984) for a fun texture addition. Cutting a standard card size of 4-1/4" x 11". Score and fold in 1/2 at the 5-1/2" point. 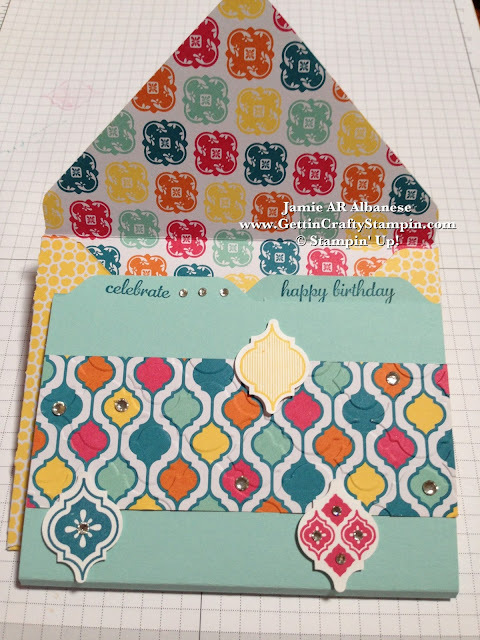 Creating the cute tabs is oh so easy with the new and awesome Envelope Punch (#133774). I can't wait for my upcoming Push the Envelope class (RSVP's required by this Friday 9/20) and with in-person or virtual options - no matter where you are or when you can attend and learn the great techniques while the class includes ownership of the Punch!! 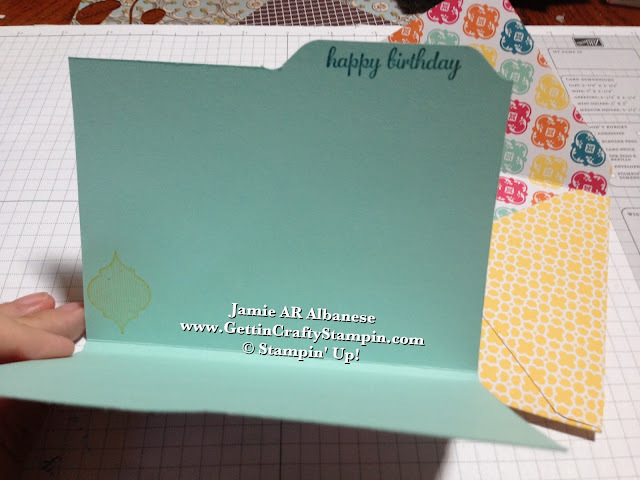 Applying an additional bottom core at an 1/4" you will allow for the addition of gift cards or cash and even look more like a real file folder!! 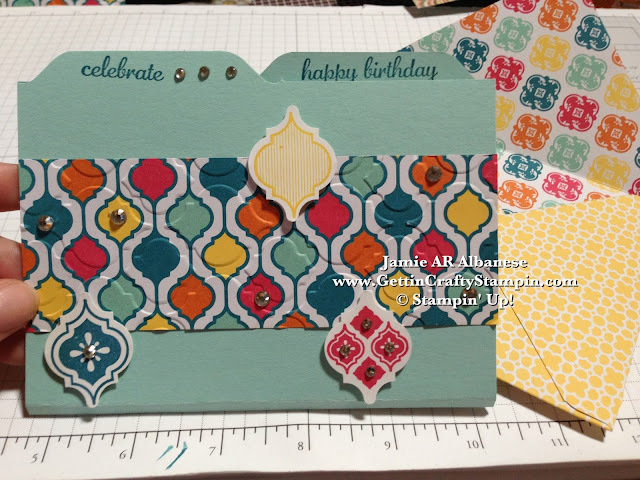 Here the two tab card accommodates the Hostess Exclusive Express Yourself (#130339) stamp set on each tab... the Celebrate sentiment has a '...' for the second tab's Happy Birthday sentiment. I love the addition of bling and sparkle using our Rhinestone Basic Jewels (#119246) in varying sizes for a cool addition. 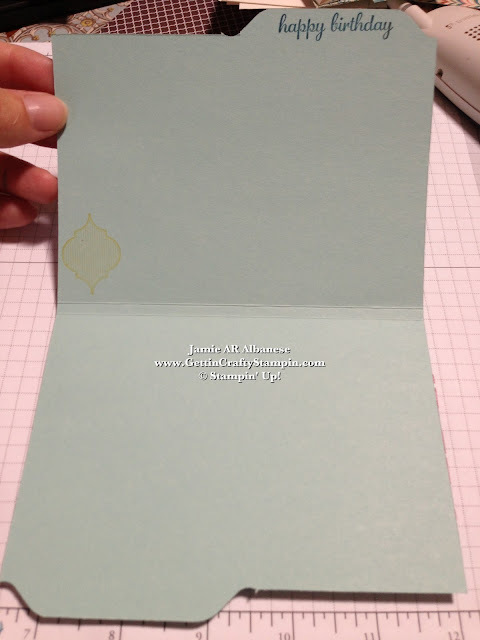 Incorporating a small Mosaic inside continues the fun and continuity of the card. I can see using this in a small file folder box with reminders of birthdays... what a fun way to get more out of a card and yet stay organized!! Bold colors, stamped and punched raised with the aide of our Stampin' Dimensional adhesive (#104430) and dashes of sparkle rock! 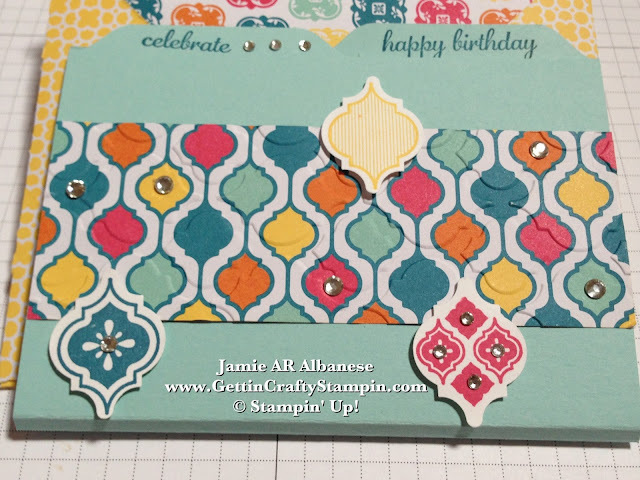 Tucked into a coordinating envelope, created with the new Envelope Punch, is a fun way to have a card get you excited before you even open it!! The Envelope Punch allows you to create 66 varying sizes of envelopes that you can mail or hand deliver, how cool is that?!?! 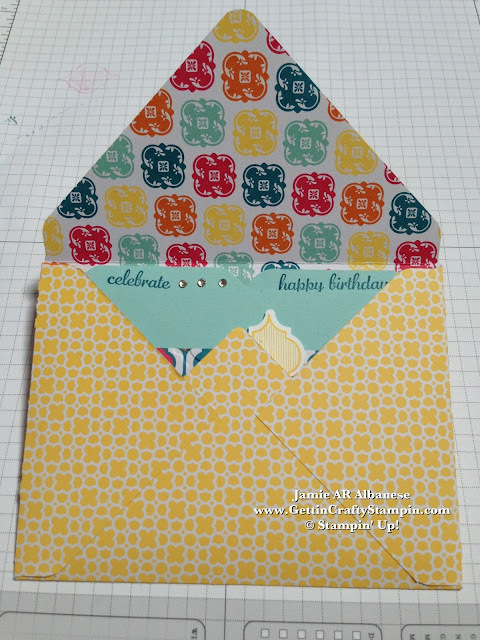 Perfect fit, bold, bright and fun... the envelope closes and accommodates the cool card inside! 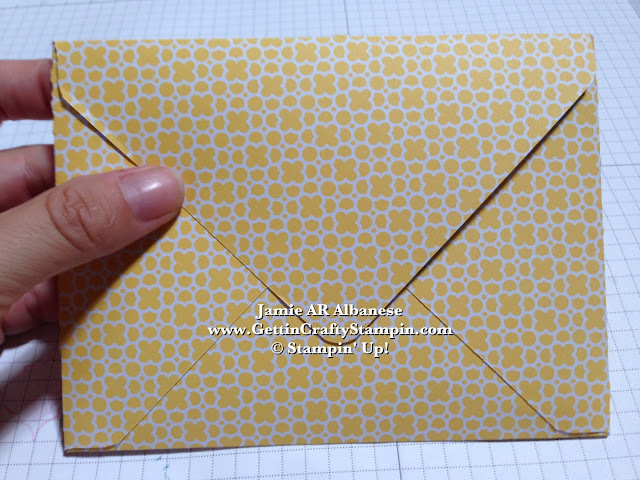 Created so quickly and easily with the envelope punch - I created this envelope in under a minute and the WOW results are sure to last a long time!! Our double sided designer paper allows you to have an automatic liner that coordinates inside of it!! I love that our products makes meeee look good! Inks I'm using are Island Indigo (#126986), Daffodil Delight (#126944) and Strawberry Slush (#131178) as they coordinate perfectly with the Quatrefancy paper on the Pool Party card stock (#122924) and Whisper White card stock (#100730). Two Tabs - I can't wait to set up my index box to store gift lists, ideas and birthday calendars! 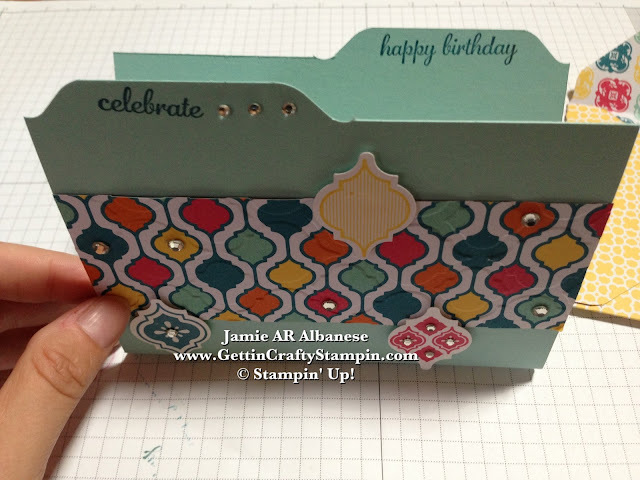 Taking this card and re-using, re-purposing it for continued organization and style!! Coordinated Papers, Stamps, Punches, Bling, Inks, and more... CLICK HERE to see our stunning line up of award winning products!! Getting Organized and actually sending celebration wishes out in a timely manner has me so excited... and looking good while doing so has me giddy! Being a Neutral card - bold, bright celebrations while being available to cover most anybody's birthday... I hope that this card brightens your day, it sure did mine! !